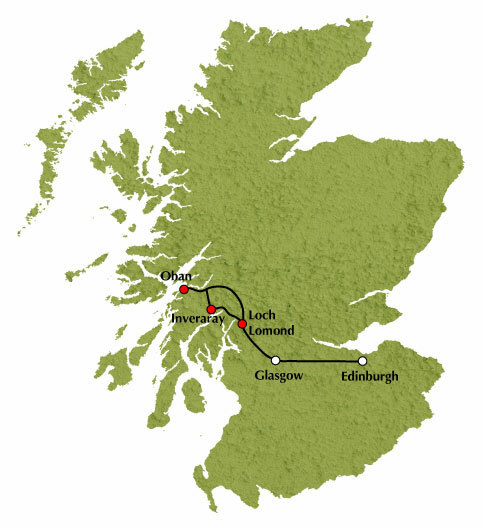 From Edinburgh, we travel to Glasgow, Scotland's largest city then make our way along the "bonnie, bonnie" banks of Loch Lomond to Rob Roy Country and the Highland village of Tyndrum. The "Rest and be Thankful” mountain pass leads us down to the original road built in the 18th century by General Wade as we make for the magnificent Argyll Forest Park. We return to the gentle shores of Loch Lomond once more from where it's only a short drive to Glasgow and then on to Edinburgh.